Just a quick little two-card general advice/food for though draw with another favorite deck, Tarot of the Absurd. First thought: two majors in such a small spread suggest quite the strong message indeed - interesting. We have paired The Star and Justice. 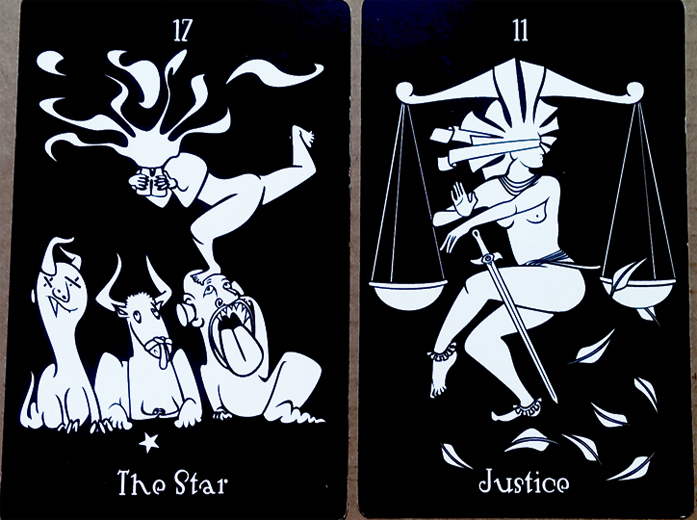 The Star is a familiar card, featuring as is did in the Thoth two-card reading I posted the other week. A theme, the fact that it is showing up in deck after deck? But look, how different the card is here, both from the imagery of the Thoth's and from the traditional RWS and clones. Here there is no woman reaching up to grasp, nor pouring water from a jug, nothing so esoteric. Instead we have a more bizarre image - A woman walking, perhaps even prancing over the heads of strange beasts, each of of them distinct in their oddity. She is looking down at them with a pair of binoculars, inspecting, fascinated. Next to her we have a more familiar image for Justice, a sort of classical figure but for the fact that she seems to be dancing, or perhaps entering into some kind of performative fighting stance, rather than standing still and stoic as we more often see her. She has her sword, and her scales, and in this deck she is blindfolded, weighing without seeing what. Her scales are balanced, one empty, the other with a stream of feathers - a reference perhaps to mythology, Maat - falling out of it. That inspiration, that hope, that 'dreams' and goals and finding a way to live, are not thing we can only find in the abstract, in pondering, in books. They do not always have to be high-minded things, the products of so much thought, the kind of thing that sounds impressive. Nor do they have to be like anything you would expect, and they do not have to be distant, theoretical things. No, inspiration, healing or hope can be found in things that are strange and even ugly, unpleasant perhaps at first; they can be things mundane, unremarkable to most people, small; they can be found in the world around you, the things you walk over and past and through, the things that grab your attention and hold it and leave you longing to see more, know more, to do it again. And sometimes, finding these things and holding onto them means pushing past that first instinct to judge against already held notions, or to weigh the pros and cons logically and put into organized thoughts emotions you cannot explain. Sometimes it means trying something blind, knowing that there are things, perhaps even significant things that you just do not know, cannot know; it means going in blind, willfully, and that can feel like some kind of tricky, dangerous dance, and it might be tempting to question, to overthink, 'should I, should I really?' and weigh things against what ought and what should. Indeed, sometimes you must recognize that scary and unknowable and bizarre might be worth it even if you don't know why and how and, within reason, go ahead and see, give it a chance.